Holding ourselves open and alive feels really great and our radiance glows easily….until we hit an old belief or issue within ourselves. And suddenly our inner beauty first dims to our awareness, and soon to others as well. We all go through this, it is the process of being conscious. Yet without friends and mentors that are also committed to a similar walk through life, we lose days, weeks, or longer as we recover from these times. It is hard. Very hard. I have many friends that hold me accountable, and I am grateful each time their honesty nudges me back towards my own light. When I have faltered, and those old tapes are blaring loudly within me, it is these friends and mentors that love me back towards my own path. Today I thank each of you. Today I pray that each of you reaches out for these loving others in your life. Today I pray that we each surround ourselves in community so that our light shines ever brightly in our world. Our world needs us…all of us. 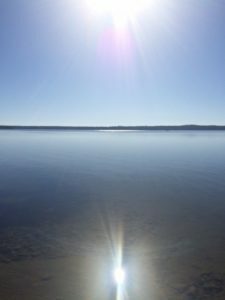 This entry was posted in Advanced Directives, Advocate, Aging, Belief Systems, breathwork, Comfort Care, Creativity, Death and Dying, DNR, emotions, Empathy, End-of-Life, family, Grief, Health, Hospice Care, meditation, Nature, palliative care, Reiki, Relationships, Spirituality, Sturgeon Bay WI, Uncategorized, writing, yoga on February 10, 2016 by Marggie Hatala. Your piece today reminds me of all those times (hard, really hard) when you appeared and nudged me back towards my own inner light. Friendships like ours that are built on spiritual awareness are lifelines….and treasures! I feel the same way. Such a treasure friends are; how valuable a treasure, when Spirit has made the introduction. A reminder of my firm belief that “we need each other” for this reflection and reminders. So grateful for you, and all in my life who are here to share this spiritual path. Wendy, your ongoing mentoring and friendship are so important to me!